5G will be a catalyst for densification, because its deployment will often be driven by the need for targeted capacity, to enhance mobile broadband experience and support high device densities; and from 2020 onwards, by IoT and industrial services which require far greater coverage in-building and in remote areas. 5G will be a particularly strong driver in the outdoor market, mainly from 2021 onwards. National objectives for 5G leadership will sometimes push regulators and governments to lower barriers for deployment in environments like smart cities. 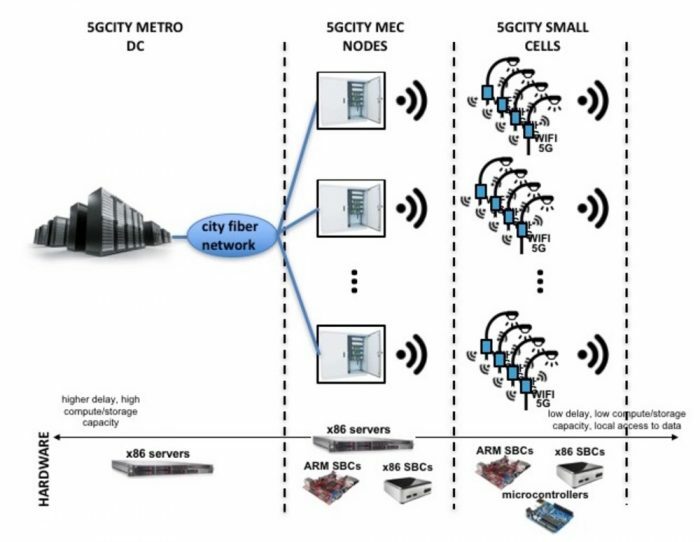 5GCity focuses on how a common smart city infrastructure (i.e., small cells and processing power at the very edge of networks) can bring benefit to both players based on resource sharing and end-to-end virtualization, pushing the cloud model to the extreme edge: starting from standard, city-run data-centres all the way to street-side cabinets and boxes/gateways deployed on lampposts and traffic lights. Partner Accelleran Small Cells and Software Solutions enable 5GCity Distributed Cloud & Radio Platform for 5G Neutral Hosts. During the Smart City Expo 2018 in Barcelona and ICT 2018 in Wien, Accelleran 3.5GHz Small Cell integrated in City of Barcelona lampost showing live video streaming from extreme local Edge Server to a 3.5GHz Smartphone using commercial 3.5GHz spectrum. 5G will mark far higher rates of adoption of emerging virtualized platforms for small cell networks. Between 2019 and 2025, deployments of this architecture will grow by 99% CAGR, compared to 57% for all-in-one units and 66% for distributed radio designs without virtualization (usually NFV-based). Virtualized systems will account for two-thirds of deployments in 2025.